The secret to business success? Get REAL and be HUMAN As human beings, we are built to connect and form relationships. So, it should be no surprise that relationships must also translate into the workplace, where we spend most of our time Companies that recognize this will retain the most productive, creative, and loyal employees, and invariably seize the competitive edge. The most successful leaders are those who actively form quality relationships with their employees, who honor fundamental human qualities--authenticity, openness, and basic politeness--and apply them day in and day out. Paying attention and genuinely caring about the effects people have on one another other is key to developing a winning culture where people perform at the top of their game and want to work.As a workplace strategist and business coach, Erica Keswin has spent over 20 years working with top business leaders and executives to build successful organizations that honor relationships. 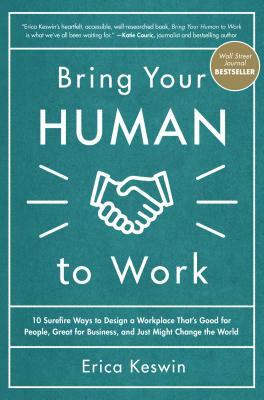 Featuring case studies from top brands such as, Lyft, Starbucks, Mogul, and SoulCycle, to name a few, Bring Your Human to Work distills the key practices of the most human companies into applicable advice that any business leader can use to build a "human workplace." These building blocks include: -Understanding your company's role in the world, beyond financial profit -Encouraging employees to be healthy in body and spirit -Running your meetings with clear purpose-Making space for face-to-face interaction-Building professional development into company culture-Inspiring your workforce to give back to the community-Simply saying "thank you"A human company is real, genuine, aligned, and true to itself. A real company flaunts its humanity, instead of hiding it. It's what the most successful, sustainable companies are doing today, and there's no reason yours can't be the same.Keswin's leadership lessons foster fairness, devotion, and joy in the workplace--all critical elements of a successful business. By bringing your human to work, you can design a workplace that is good for people, great for business, and just might change the world. Erica Keswin is a workplace strategist, business coach, and the founder of the Spaghetti Project, aplatform devoted to sharing the science and stories of relationships at work. Keswin was a consultant atthe Hay Group and Booz Allen Hamilton Inc., an executive recruiter at Russell Reynolds Associates, and an executive coach at NYU's Stern School of Business. She contributes regularly to Forbes, the Harvard Business Review, Entrepreneur, and Quartz at Work. She is an active keynote speakeron organizational culture who has recently spoken at Propelify Innovation Festival, Virtuoso Global Forum, the New York Times, Girl's Lounge at SXSW, Adweek, and WorkHuman.